2012 summer internship at c-2i, inc.
Not only did I gain invaluable work experience, but I also got to work in a basement! C-2i was founded by creator of the Talon and VP of Qinetic/Foster Miller, Arnis Mangolds. We were running numerous projects with just a handful of people and managed to get a lot of things done. My first day on the job, I conducted a field test on our line charges (part of a TSWG/JIEDDO program). It consists of 3 sections of lengths 20, 10, and 5 ft. 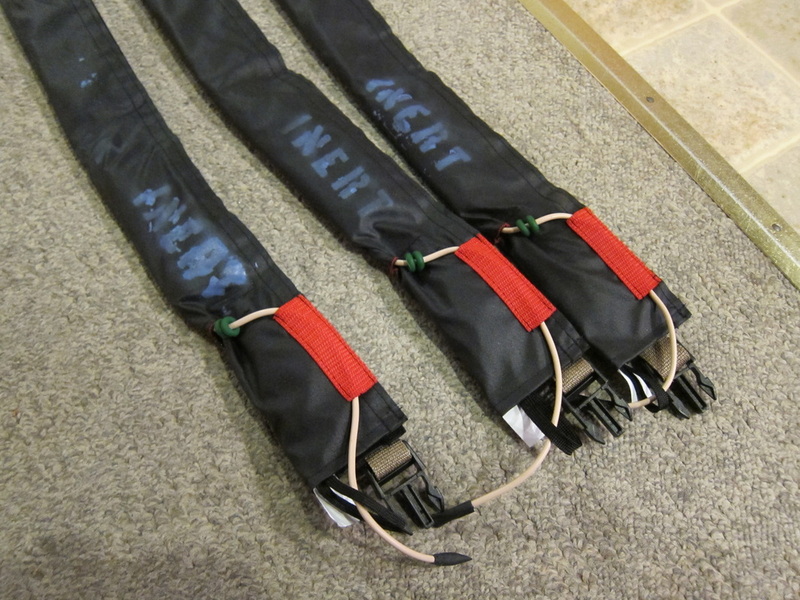 Using connectors between the det cord and the lines themselves, it's possible to throw anywhere from 5 to 35 ft of the explosives in a straight line. Although I did not participate in the initial design of the modular line charge, I researched and provided recommendations that could be made for future iterations. Between making copies of the instruction manual, fabricating the inerts, creating a rough bill of materials (BOM), and coordinating between our fabric pattern maker and the sewing factory, I've seen the beginnings of manufacturing and testing a product. Currently this project is scheduled to go out to Afghanistan to be tested and used by joint forces. For more information, an early brochure can be seen here. 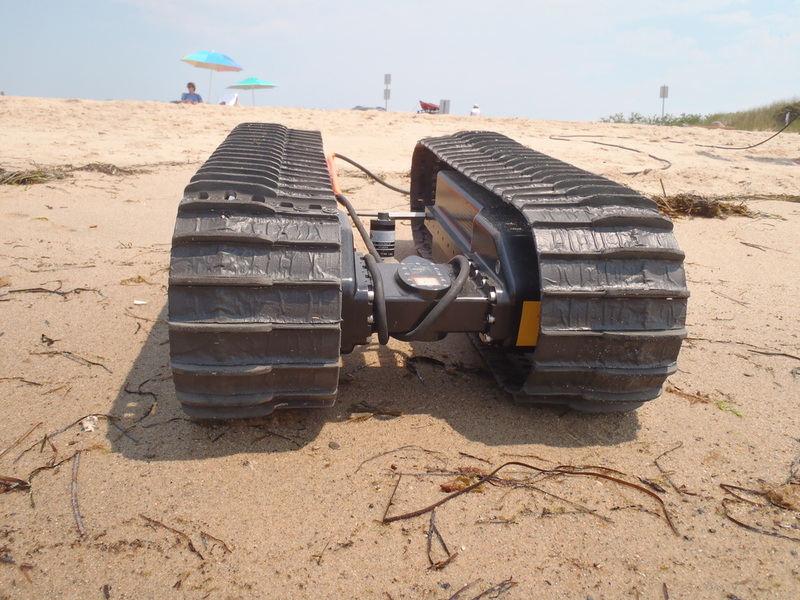 Currently sponsored by the Office of Naval Research (ONR), SeaOtter is an amphibious vehicle that is under development for use mainly in the surf zone. The goal of SeaOtter is to map out the terrain it traverses and relay important field information to the deployment crew. It's meant to be a long-range vehicle with the capability of staying underwater for months at a time. Although still in its early stages of development, there have been numerous prototypes to date. I got to spend the most time with Wet 1, the largest watertight version of the SeaOtter built by C-2i. 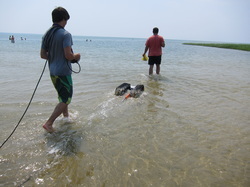 I spent the most time on field tests with the robot out on an airstrip and in the water. I was responsible for many other tasks including detecting and debugging the cause of electromagnetic field interference,developing an emergency float system, and developing a system to minimize the drag force experienced by the robot in the water. We traced the electromagnetic field interference back to the proximity between the magnetometer and the high amperage brushless motors. 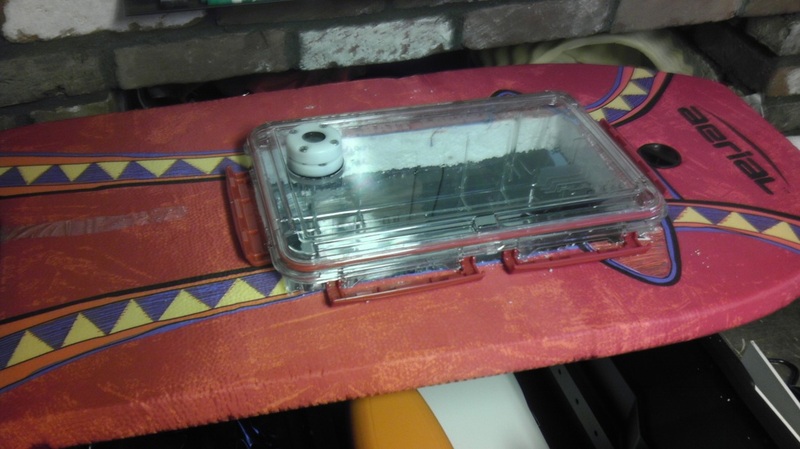 I constructed a self-righting, waterproof, floating case for the tablet (our robot controller). Using a specially designed rig where our gearbox was mounted to a block of aluminum that held a pressurized water-holding pipe, I tested our motors in conditions similar to elevations of 300 ft below sea level (approx. 150 psi) to see if our shaft seals would leak. Additionally I got to participate in real-world testing and validation. We took the SeaOtter carcass to EdgeTech in Wareham, MA, and used their pressure test chamber to determine if the carcass was watertight at approx 150psi. We suspected that the induced drag on the carcass would be the turbulence caused by the tracks, however I built a nose-like fairing for the front of the robot in hopes that it would reduce the drag felt on the front of the robot. Due to a lack of time (and the difficulty in finding a testing facility) I was unable to see the impact of my fairing on the overall drag profile of the robot. My experience with Wet 1 highly influenced my perspective on robotics. I learned that you must have a foundation in mechatronics and software if you want to build a robot that is successful, not to mention that there are many complications and roadblocks that can easily arise when developing a complex robot system. The fairing with mounted magnets. Looking at the inside of the fairing. It was hollow so that lead weights could be placed inside in order to counteract the induced lift. 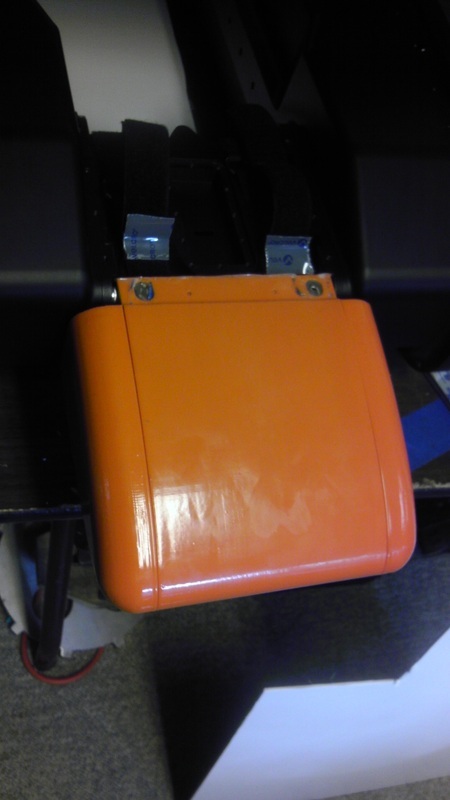 The finished fairing with a protective coat of epoxy, mounted on the robot with velcro straps. Waterproof case to hold the tablet controller in. It both floated and was self-righting. It used a cableclam which allowed the ethernet tether to pass through without resulting in leaks. A closer look at SeaOtter on the beach. HODS was one of the first projects I was introduced to when I visited C-2i. Battery cases are designed to protect batteries from contact with moisture and debris, and have to be watertight and weather resistant. Typically they are rigid containers but occasionally they can also be made of fabric. They tend to be quite heavy and take up valuable space in a base camp. 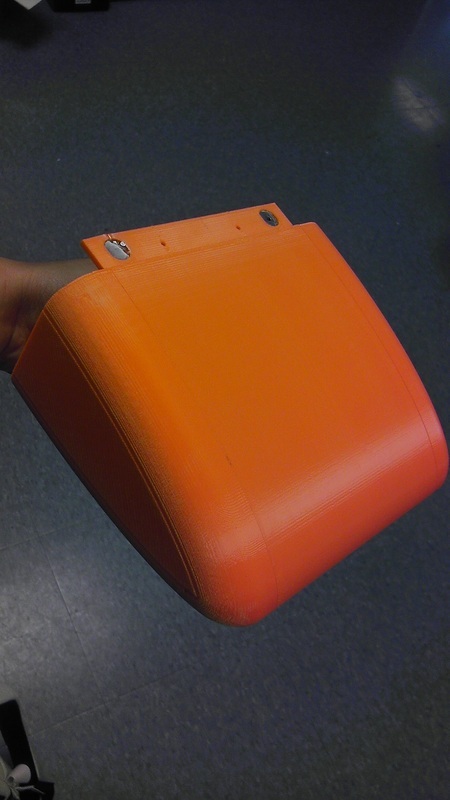 Instead of designing a solid case or a fabric bag to protect batteries from contact with water, the HODS project attempted to combine the best of both worlds by creating a modular battery pack that used a rigid base and a waterproof bag. This would enable for various sized power sources that had smaller footprints where needed. Throughout the summer we had been assembling and epoxying parts in place, and dunk testing in freshwater to see if we met the military spec. I assembled bag units that had aluminum bases with plastic lined denier bags. Unfortunately, even with a new bag design, we were unable to prevent leaks. C-2i moved forward developing a double layer bag similar to a ziploc type of inner membrane after the end of my internship. PEGS is essentially a mechanical extension cord. This project was a response to an SBIR for the U.S. Navy. The clover-shaped pad-eyes are mounted into the holding decks to securely fasten supplies, tanks, and other vehicles. Since there's no way to prevent covering some of these pad eyes while moving supplies around, the space is typically not well utilized and results in inefficient packing. The PEGS system latches onto the pad eye, can be rotated in various directions, and has a pattern that the tie downs can hook into. 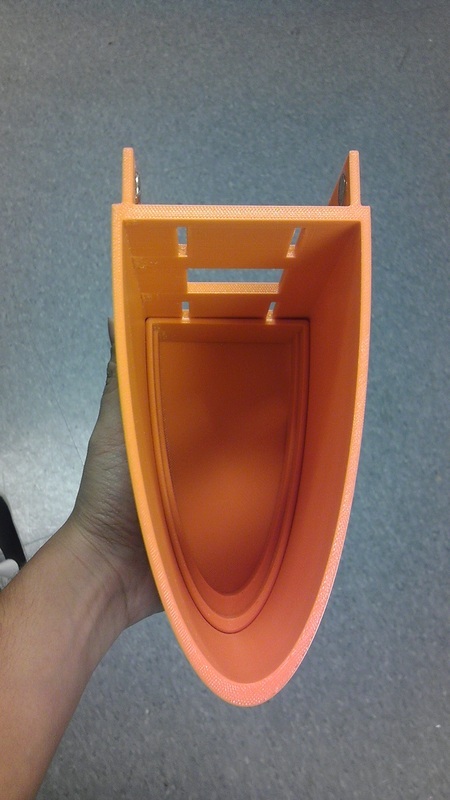 During my internship, the PEGS pad eye weighed approximately 50-75 lbs and we planned to prototype it in different lengths of 18-36 inches. My role in the PEGS project was to slightly modify the system in order to create sight lines that aided visibility in latching our system into the pad-eye on the deck. I also helped build prototypes of the system. The PEGS design successfully passed early evaluations. As of Sept. 2012, C-2i was waiting to find out if they would be awarded SBIR Phase II funding to continue the R&D efforts initiated in Phase I.